Leeds United, under new manager Marcelo Bielsa, got their season underway against Stoke City in the August heat live on Sky Sports on Sunday. The chaos reigned around Elland Road, but Marcelo Bielsa was unmoved. Perched on his bucket as Mateusz Klich rounded off a breathtaking passing move to open Leeds’ account for the season, he was the coolest man in the searing August heat. The quirks and intensity we heard so much about came to the fore in a seismic 90 minutes against Stoke City. While it’s far too early to get carried away, it proves that the research and work Bielsa did on the Championship was no lie. Stoke City manager Gary Rowett said that it was “a reality check” for an expensive squad composed largely of Premier League players. His criticism of their play was understandable, but it came from a perfectly orchestrated pressing game that forced Stoke to retreat. Football at that intensity only works if everybody follows the system, and it played out like a world-class opera with the maverick artist at the helm watching his art unfold. The stillness of Bielsa shows a man that isn’t overly emotional. He won’t get carried away with that game. His bucket represents more about the man than you could ever realise. At 63, he’s seen almost everything in football. From the passion of Argentinian football to World Cup’s, with a Europa League final for good measure. He knows that nothing is certain in football, and the immediacy of the game causes overreactions to situations that in the bigger picture aren’t as important as they might seem. His post-match interview, the first he’s EVER done as a manager, where he relayed his message in English, with help from his translator, was amusing. His desire to embrace English despite not speaking a word of the language when he arrived is admirable. It also proves his commitment to doing this job properly, and for the long term. It’s often said that there’s a culture shock in English football, in particular the Championship, due to the intense and physical nature of the game, but Bielsa is making the effort to embrace post-match interviews and speaking English where he can. He’s showing respect for the traditions and for the media. It might seem inconsequential, but the small steps piece together a man who is as intense as he is diligent. Of course, the real litmus test in the Championship is always a more physical game – Millwall away is usually where Leeds come unstuck. But each game has different challenges, and the unique way in which Leeds will be playing is a different challenge for the opposition to overcome. A supremely fit squad that have been coached to within an inch of their lives bodes well, but not every game will be a success. Although, ask Bielsa and he’d say it wasn’t an all-out success. His assertion that he was “disappointed” with their game management in the last 20 minutes seems at odds with fans’ perceptions. But Marcelo Bielsa operates at higher standards than any of us are used to in the past 15 years. 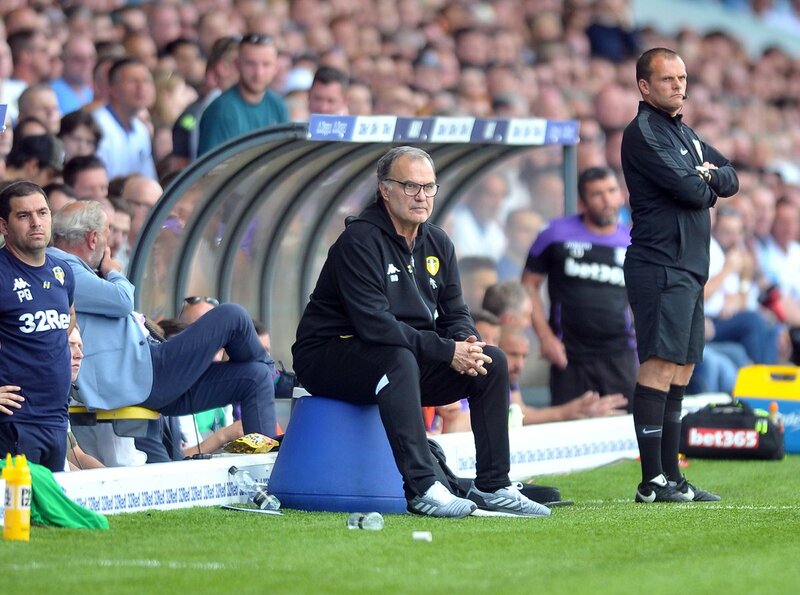 Marcelo Bielsa, perched on a bucket, overseeing a 3-1 opening game victory against the pre-season favourites for promotion. His view unobstructed, he can analyse how well they’re taking his messages on board. The attention that he garners from all corners of the world – from Argentina and Chile to Spain and France, is normal for him. But he’s not normal, he’s enitrely unique, he’s known as the ‘Godfather of modern football’. He’s the man that Pep Guardiola calls the best coach in the world, and whom Mauricio Pocchetino considers a mentor. Embrace it, because it’s going to be a hell of a ride. With only one new signing in the starting line-up, the performance levels were simply unrecognisable from the team that laboured to a mid-table finish just months ago. It’s Marcelo Bielsa’s Leeds United, and hope springs eternal.